Oats are a super beneficial food for lowering cholesterol and blood sugar, due to the soluble fiber they contain, which reduces the rate at which the food leaves the stomach and so the glucose absorption is delayed. In addition to this great benefit, oats also contain phytonutrients that protect against oxidative damage, cancer and heart disease. They are also excellent immune system enhancers. 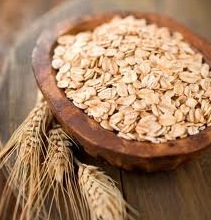 Oats are rich in vitamins B1, B2, B3, B5, B6, E, K, biotin, folate, calcium, magnesium, phosphorus, iron, potassium, zinc and protein. Oatmeal is a healthy nutritious breakfast and only takes a few minutes to prepare. Just boil oats with water and add apples, blueberries, dates, almonds, flaxseeds, walnuts, raisins, or whatever you can think of!